The Saturday Shopping Shuttle provides free transports to students Saturdays from 11:15 am to 4:00 pm. Signs have been posted to identify each stop on campus. The shuttle will circle campus using a clockwise loop around campus with scheduled stops at Lot-A, rear of Marycrest, rear Virginia W. Kettering, SW corner of Stuart Hall, Marianist/Founders Hall, Campus South and the Caldwell Housing. From the Caldwell Housing the bus will proceed to a shopping area which includes Walmart and various restaurants on Dorothy Lane and S. Dixie. 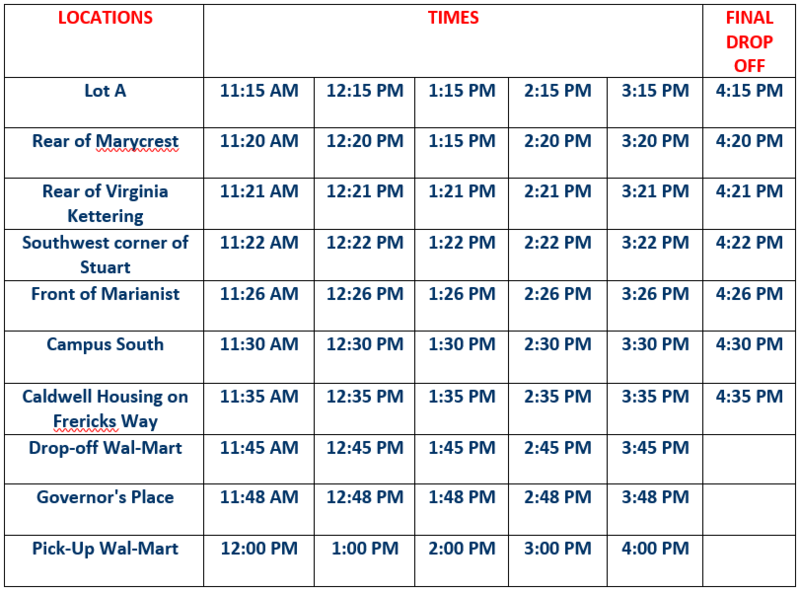 The bus will depart from Walmart on the hour and the last bus from Walmart will leave at 4:00 pm. The shuttle to these areas will provide convenient transportation for ALL students and will accommodate first year resident students who are not permitted to bring vehicles to campus. The University provides a campus shuttle service while classes are in session. Please click on the below link for information about the campus shuttle service. Medical Transports are provided to resident students with disabilities and/or medical conditions. Resident students with disabilities will be afforded one “round-trip” transport each day, from their residence to campus and back to their residence. Students utilizing the Transport service must live within the “university area” as detailed in the mutual aid agreement between the University of Dayton and City of Dayton. Student utilizing this service are responsible for notifying the dispatcher when they require transport. Please call 937-229-2121 to make arrangements. Contact M.A.P. at (937) 229-2121.